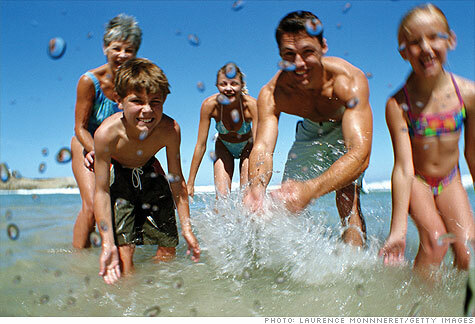 (MONEY Magazine) -- Wouldn't it be great if your next big vacation could include your entire family -- as in, three or four generations? Such trips are becoming more common, according to travel marketing services firm Ypartnership, and it's easy to see why. Grandparents get quality time with the little ones; parents get built-in babysitting; kids get double-time doting. Everyone makes lasting memories. The only drawback -- aside from the potential for certain family members to drive others batty -- is the fact that group travel gets expensive fast. Based on average domestic airfare and hotel costs, you're looking at a minimum $3,000 for a four-night trip for six people, not including food and activities. The tab will be higher still if you go during a school break when lots of other families are hitting the road, says Peter Yesawich, CEO of Ypartnership. But good planning can make your dollar go considerably further. MONEY asked travel experts to share their best strategies for cutting costs on transportation, lodging, eating out, and entertainment when traveling with the whole clan. Plus, these pros suggested some family trip destinations that offer excellent value, whether your budget is big or small. Drive if you're in the "radius of efficiency." In part because of surcharges and taxes on airfare, you'll almost always save money by driving if your destination is within 400 miles and you're traveling with more than two people, says Ed Perkins of SmarterTravel.com. For longer trips, determine what it would cost to drive with AAA's fuel calculator -- which lets you enter starting point, destination, car make, and model -- and compare it with current fares. Fly at the right time. Families going by plane may want to plan trips for the last week of May, first week of June, or last week in August, says Rick Seaney of FareCompare.com. People prefer not to travel on these edges of summer break -- which means prices up to 25% less, especially for family hot spots like Orlando. Buy at the right time. Book spring break tickets from early January to early February; shop for summer flights no more than 3½ months out (when airlines start releasing cheaper fares), Seaney says. When searching for fares, look both for your entire party and a single person. "Airlines have a quirk in their systems where you can maybe find two cheap seats, but once you ask for three, all people are moved to the next higher price," Seaney notes. If you book separately, you can request adjoining seats later. Think outside the hotel box. With a large group, renting a house or condo can often save big bucks over multiple hotel rooms, says Judi Chaitman of travel agency Great Getaways. In Seattle three rooms at a three-star hotel cost an average of $423 a night, according to Hotels.com; meanwhile, you could get a three-bedroom condo for $244 a night, HomeAway.com reports. You typically get a discount -- as much as 30% -- off a rental's daily rate by booking a full week. And you may be able to negotiate more off, notes Shannon Hurst Lane of the blog TravelingMamas.com. She once nabbed a rental for $200 under list price by letting the owner know her budget was $1,000. Bonus: Having a kitchen can help cut meal costs too. For rental listings, check out VRBO.com and HomeAway.com. To protect yourself, read reviews; ask for a contract; and pay by credit card. Ask for the manager. Think a hotel is a better option? The usual aggregator sites offer decent deals for single rooms. But for bigger parties, call hotel managers or front desk reps directly. The industry is still hungry for business, and these folks (who Lane says often know the inventory better than reservations agents do) may offer you a discount for filling several rooms or pricier suites. They can also tell you when the hotel is less busy and therefore cheaper -- helpful if your travel dates are flexible. Look for a suite deal. For urban destinations, you may find a competitive price at a suite-style extended-stay hotel geared toward business travelers, notes Theresa Jorgensen, who blogs about big family vacations at SixSuitcaseTravel.com. These tend to be a few miles outside city limits, but the price difference can make up for the inconvenience. Just 10 miles from Washington, D.C., in McLean, Va., you can score a two-bedroom suite that sleeps six for $309 a night at the Staybridge Suites, a subsidiary of InterContinental Hotels. Comparatively, you'd pay $195 per hotel room in the District, reports Hotels.com. Other chains to check out: Hyatt's Summerfield Suites, Marriott's Residence Inn, Starwood's Element, and Hilton's Homewood Suites. Include board. Are your relatives big eaters? You may save with an all-inclusive resort or cruise. The resorts are common in the Caribbean and Mexico, and summer is low season there, which means per-person rates up to 30% less than in winter. Just be sure to check what's included; alcohol sometimes isn't. With cruises in particular, you must exercise willpower to save: "They make it enticing to spend more on alternative restaurants, wines and spas," notes CruiseCritic.com editor-in-chief Carolyn Spencer Brown. Cut the price of activities. Tickets for theme parks, museums and shows really add up. So call ahead to ask about group rates, which some attractions offer to parties as small as eight. If that's not an option, at least take advantage of discounts for the various generations -- be it child, college student, or senior; some attractions have special rates for AARP or AAA members too. Also look for coupons at the visitors' bureau website. Make lunch the main meal. Restaurateurs in tourist centers know they have a captive audience, and price accordingly. If you have access to a kitchen, consider eating a big midday meal out and a light dinner in; you'll save upwards of $10 per entrée. For an easy supper, Lane, of TravelingMamas.com, has Omaha Steaks delivered to her family's rental condo. Six five-ounce filet mignons cost $60 -- a price you'd be hard-pressed to beat at a restaurant.